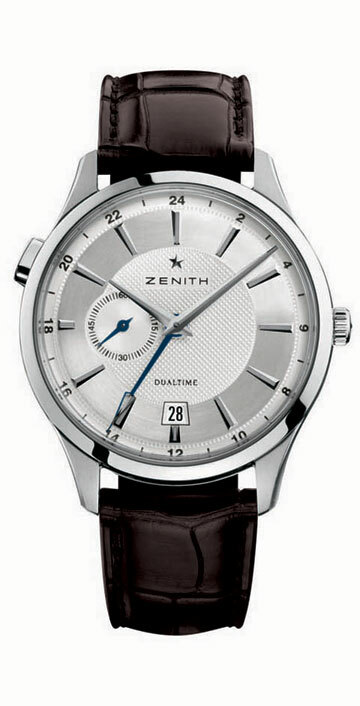 Zenith Elite Captain Dual Time associates a stream lined design and a strong identity expressing a very masculine elegance. Equipped with a GMT hand with a different design it has a blue pointer that ensures optimal readability. This hand is set using a push-piece at 10 o’clock. This mechanism makes it possible to adjust the second time zone with a simple gesture, without risking the deregulation of the time on the watch. The 40 mm watch is available in two versions with a silver or black “Clou de Paris” guilloché dial, in a steel case, with a metal bracelet or alligator-skin strap.